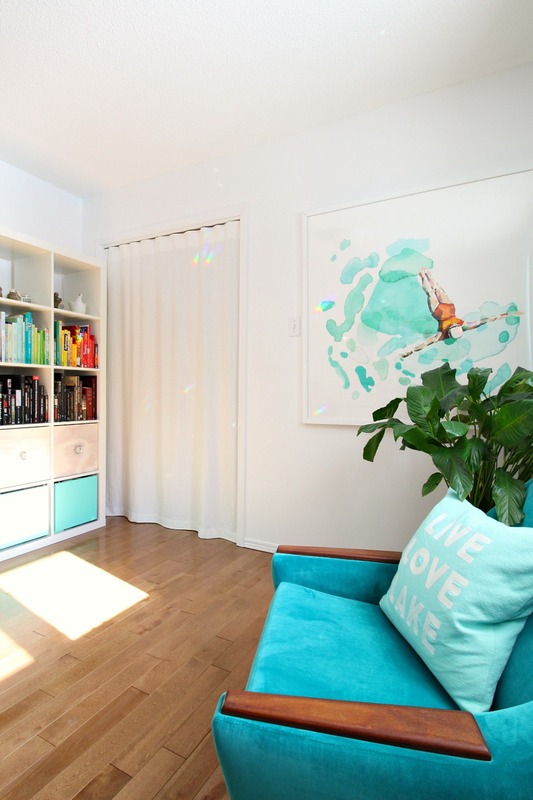 I have an obsession with squeezing as much square footage out of a house as possible. In both the townhouse and our current lakehouse, I’ve crammed closets full of furniture, art – basically treating some closets as mini rooms. Now I’m transitioning our office closet into the most ambitious purpose yet: a teeny, tiny home gym. Now the office closet is home to our sleek new SpaceWalker treadmill and we’ll be tackling some more projects, like adding a fan, installing and outlet, and storing our weights, etc. Even though the new treadmill is so gorgeous, I still wanted the option to conceal this space so I enlisted my Mom to sew a DIY closet curtain. 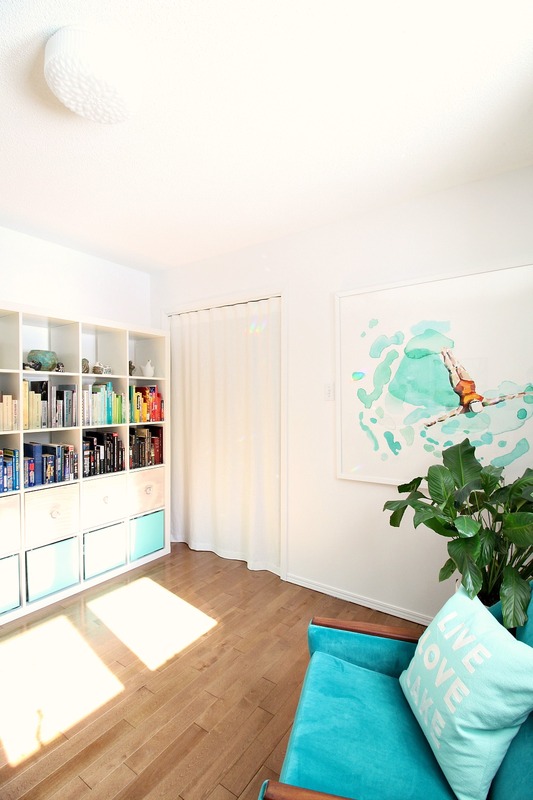 When we moved here, I had to choose between the existing bi-fold closet doors and a smaller Ikea Expedit, or no closet doors and the bigger Expedit – I chose the latter, with no regrets! 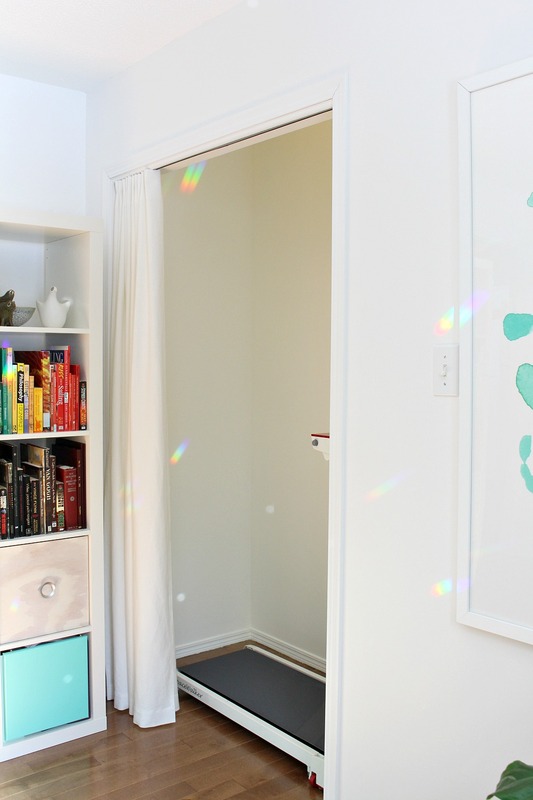 A sliding door like the beachy glass one in our bedroom would be lovely but so awkward, because the bookcase is pretty close to the closet opening. 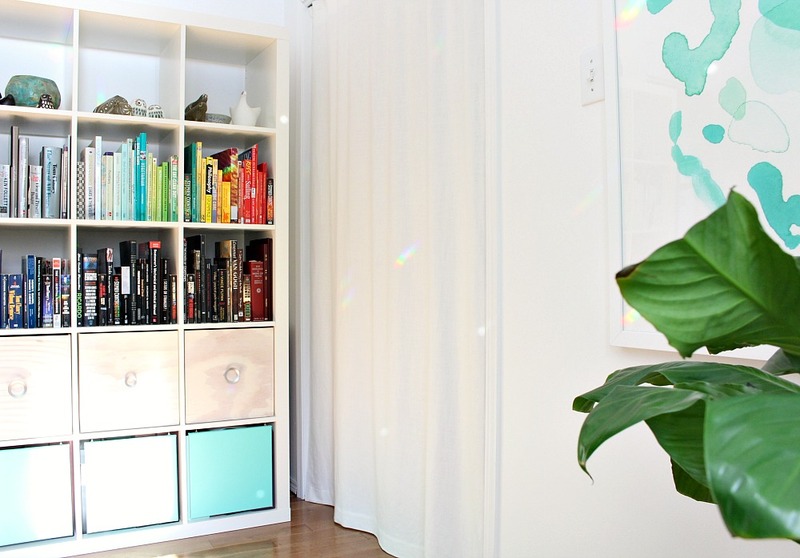 One day maybe we’ll spring for a pocket door (or ditch the Expedit? 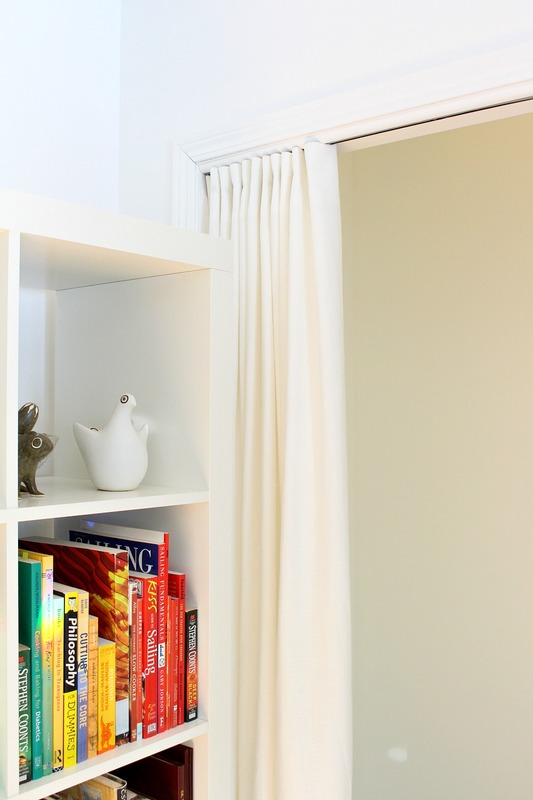 ), but we had leftover curtain track from the laundry room curtain system, and I found a gorgeous cream linen for only $3 per meter – so clearly the Universe was steering me in the direction of a closet curtain. I wanted to do the closet curtain the same way my Mom and I did the laundry room curtains, because seeing the track never bothers me, but my Mom is so ambitious. She’s always thinking big and she has so many clever ideas. 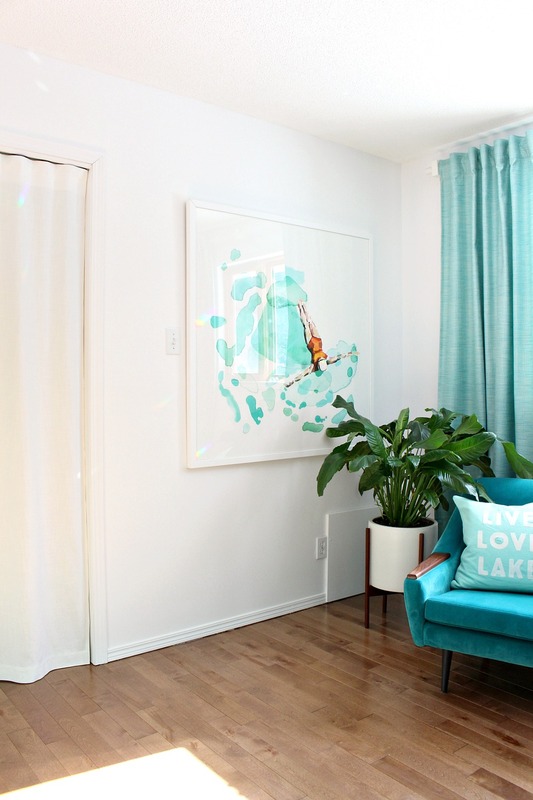 With some work reflection, she came up with a simple DIY curtain that easily hides the curtain track and looks so seamless. 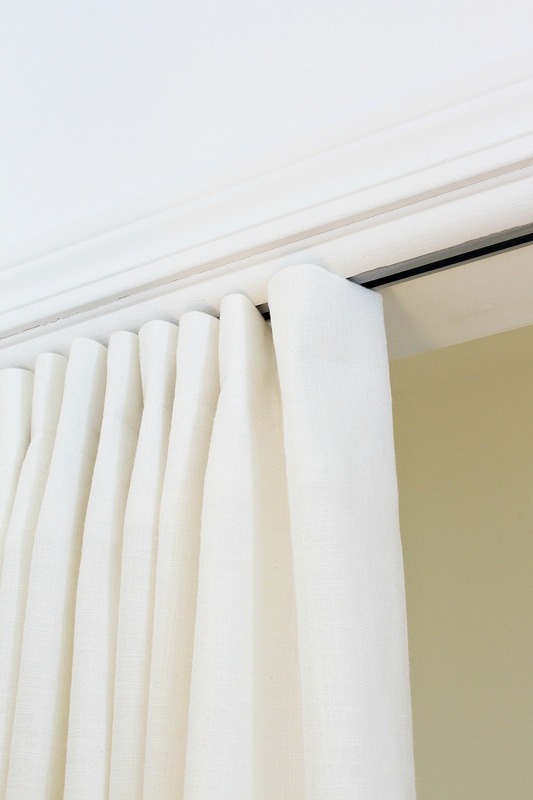 Here’s how to easily sew a curtain that hides a curtain track. The process was actually very straightforward. First we washed and dried the fabric to settle any shrinkage and then gave it a quick iron. 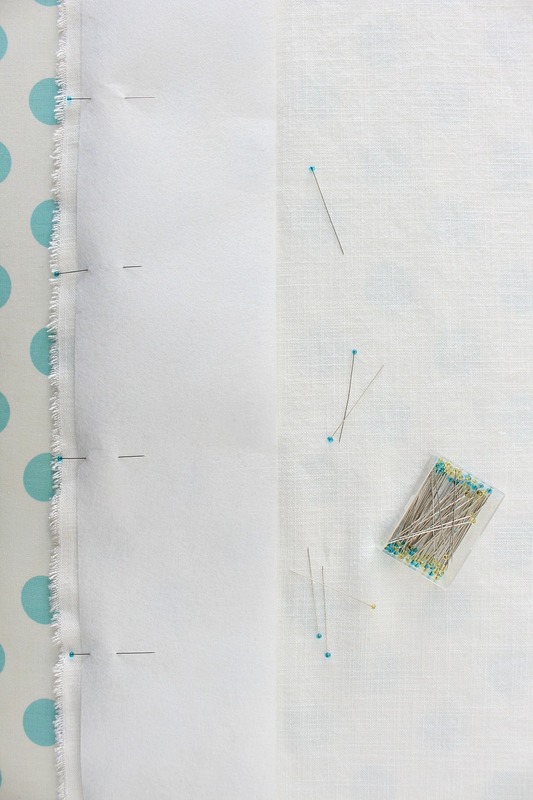 The edges and bottom were hemmed as usual (folded over, ironed, sewn down) – pretty basic for a curtain. The top is where we got creative. 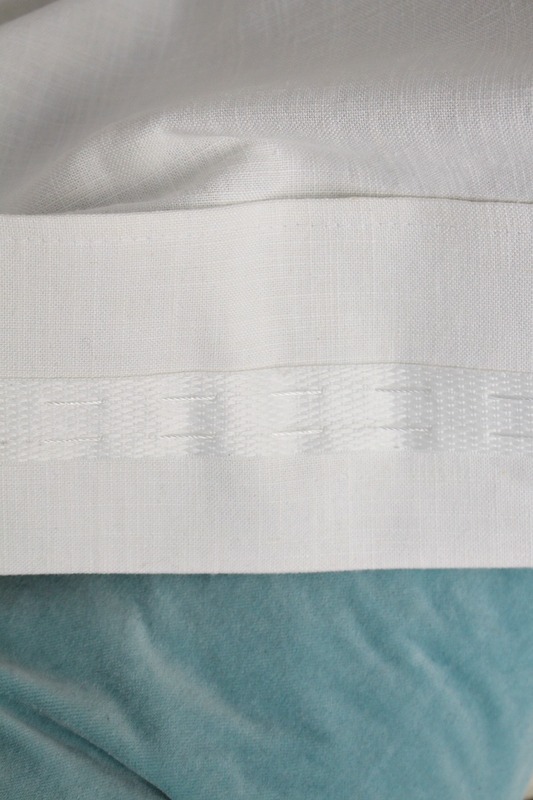 To stiffen the top and keep it from drooping and exposing the clips and curtain track, we used non-woven interfacing, which was sewn right into the top seam to give it some stiffness. Next we sewed on some shirring tape, focusing the stitching on the bottom third so the top edge of it was loose. This is where we attached the clips from the curtain track and – voila! 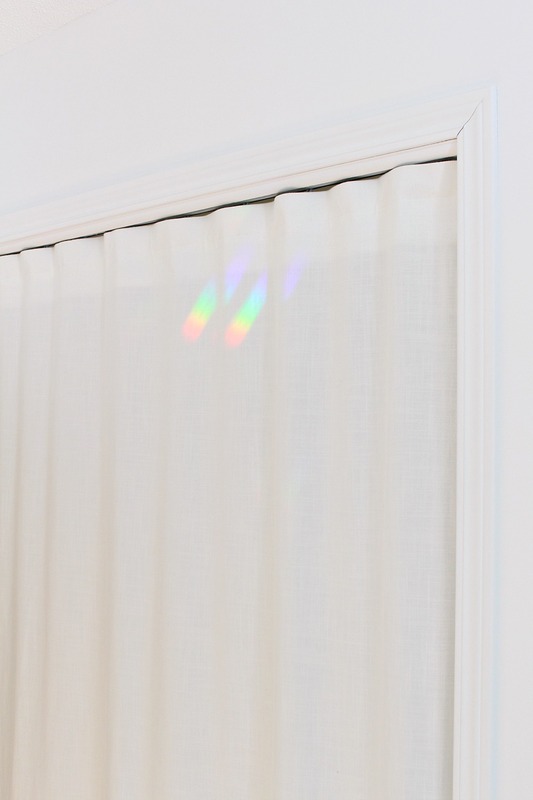 – a super simple curtain that hides the track! We didn’t do any ruching or shirring, we just evenly spaced the clips and so when the curtain is closed it has some soft folds. I love this as a solution because it was fast and easy! I know not everyone would opt for a closet curtain because it can look dangerously student-y, but living in this cottage on the lake I think I can get away with some relaxed design choices. 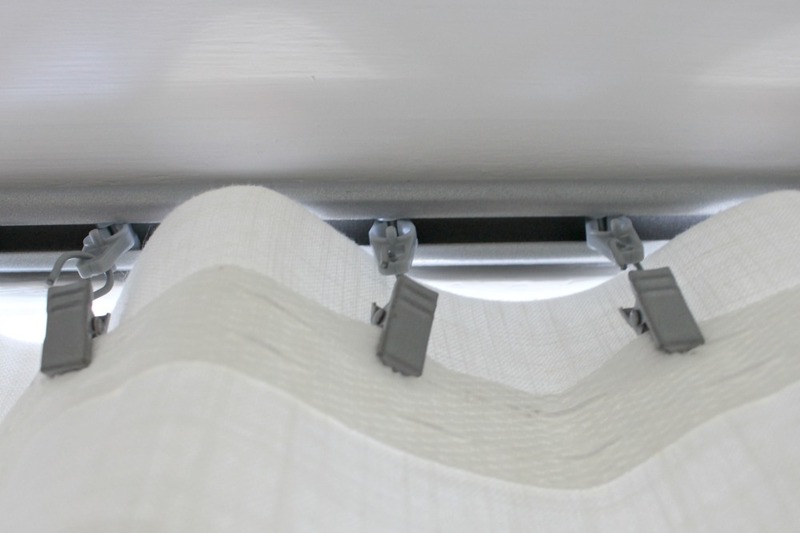 I wanted to share because if anyone liked the idea of a curtain track – but not how I opted to keep the track visible in the laundry room – then this is an easy alternative. I am starting to lose track (haha) of how many curtains my sweet Mom has helped me make! Thanks to my Mom, after that little patterned curtain misstep, both the bedroom and the office boast beautiful back tab tweed curtains (if you need a really detailed back tab curtain tutorial, here it is), the bathroom has a custom, floor-to-ceiling shower curtain, the laundry room is hidden behind some pretty polka dot drapes on a track – and don’t forget the clever layered sheers she made for the townhouse and those sweet ruched curtains for the guestroom. Speaking of guestrooms, she whipped up dreamy sheers for the bunkie too – oh, and the silk drapes and bedroom sheers in the townhouse as well. The only space that doesn’t have curtains yet? I love the look of the curtain track and curtains! 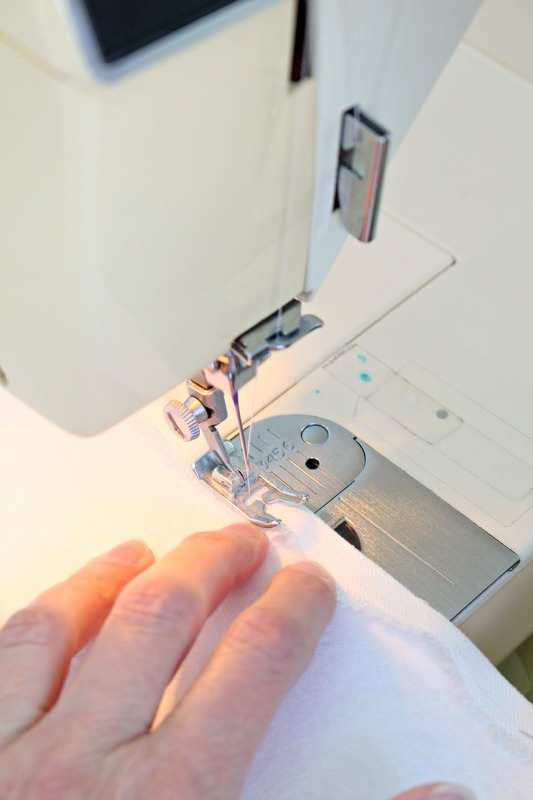 I avoid sewing, even though I know how to do it;) I'm wondering if there is a way to avoid sewing altogether? I guess I could possibly send to our dry cleaners, who does some sewing for us. 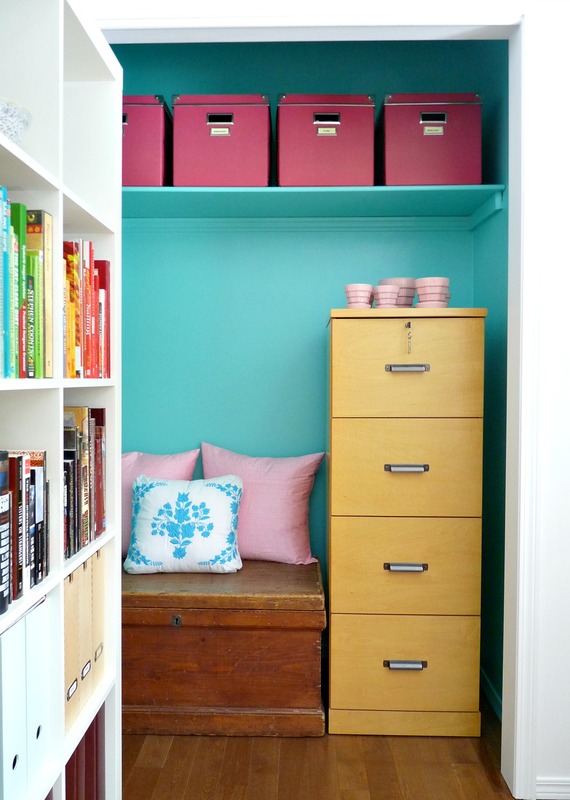 Thanks for sharing, the closet looks so clean and seamless. What a clever way to sew the heading – way to go, Mum! It looks just like a fancy S-fold heading. I'd like to use that kind of track for a shower curtain when I renovate my bathroom. Do you think it might work? I was thinking I'd mount it on the ceiling and make my own super-long ripstop nylon curtain. 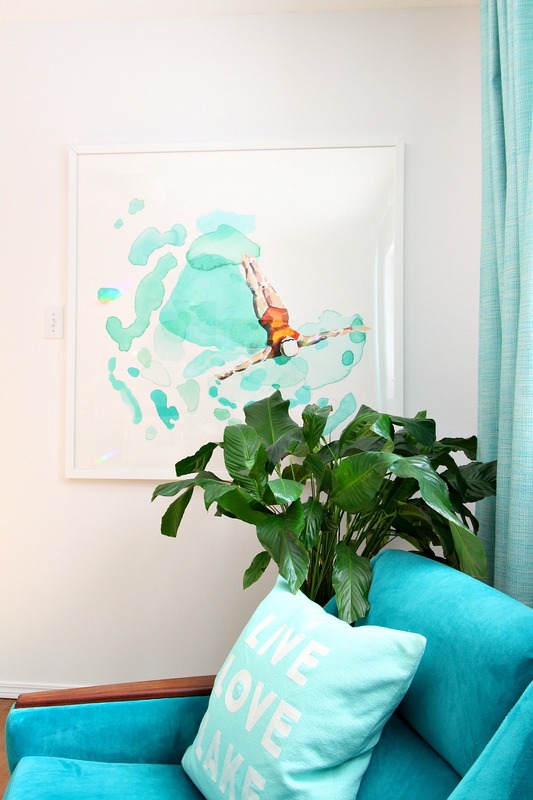 I love the idea of a DIY shower curtain! Then you can make it a custom length. The only issue I can see is moisture? I’d make sure you buy a track that won’t rust from humidity. But then again, the ceiling mounted curtain rod we have for our DIY shower curtain is exposed to humidity without any issues and it’s definitely not designed for bathrooms…. I would love to see what you make!! Love this idea! Our house was built in the 1940s, and its closets are large cupboards with two drawers at floor level. 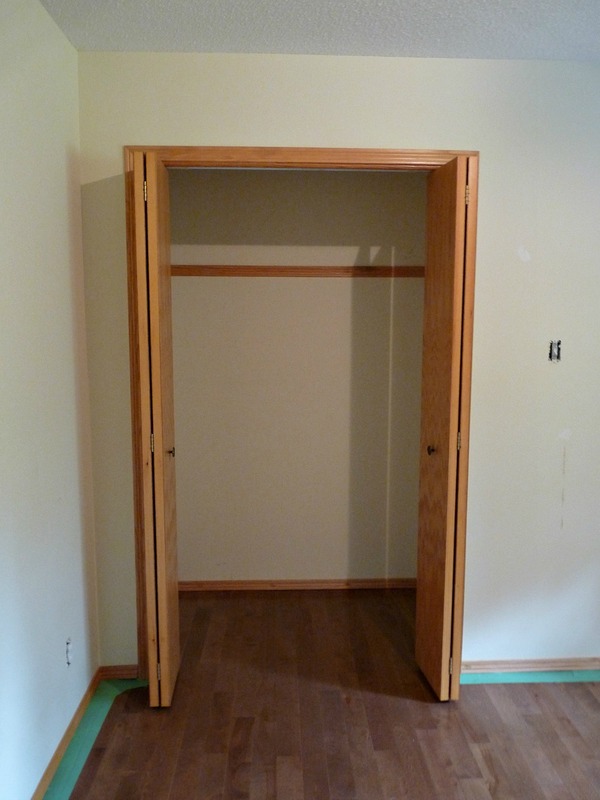 They originally had very heavy bypass doors on the closet part, which made access to the closet difficult. So of course, they now stand open to the world, without any doors at all. I've been trying to think how to cover the not-always-perfect jumble we have in there. This is a great solution. 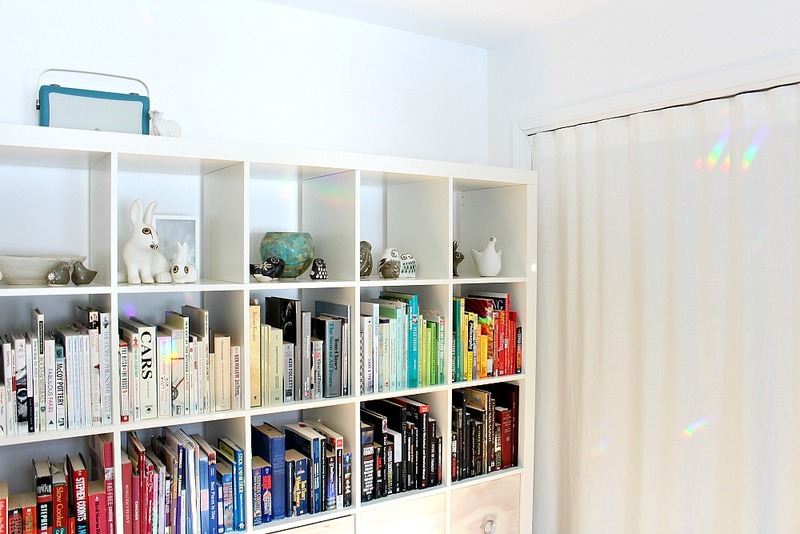 Do you know anyone who has used the Ikea curtain track for this purpose? I'm guessing it's not as sturdy as the one you show, but am wondering if I could get away with it for one of the less-used areas. I’m not sure about the Ikea one. We have used ikea curtain rods in the past and I’ve never had an issue with quality. I think with a lighter weight fabric, like this linen, it should be fine. I’d be wary of something super heavy if it’s a really inexpensive track system but it doesn’t sound like you’d be making very wide panels anyway. Sorry I can’t be of more help! Ohhhh, so nice. I think the hidden track makes it look tailored, avoiding any resemblance to a dorm room. I'd love it my mom had some mad sewing skills. I can sew a little (sticking mostly to throw cushion covers) and I'm sure I could manage a curtain project but I find it daunting to even contemplate a simple sewing job. Props to your mom! Thank you! I am so lucky my mom is so talented. We have a lot of fun working on projects like this together. I always feel so emboldened when she’s around – I’d be too scared to make a mistake in my own and I would totally stick to the basics, haha.